My father, Mr. Keshavji Rupshi Shah, deep in his Paryushan Meditation. 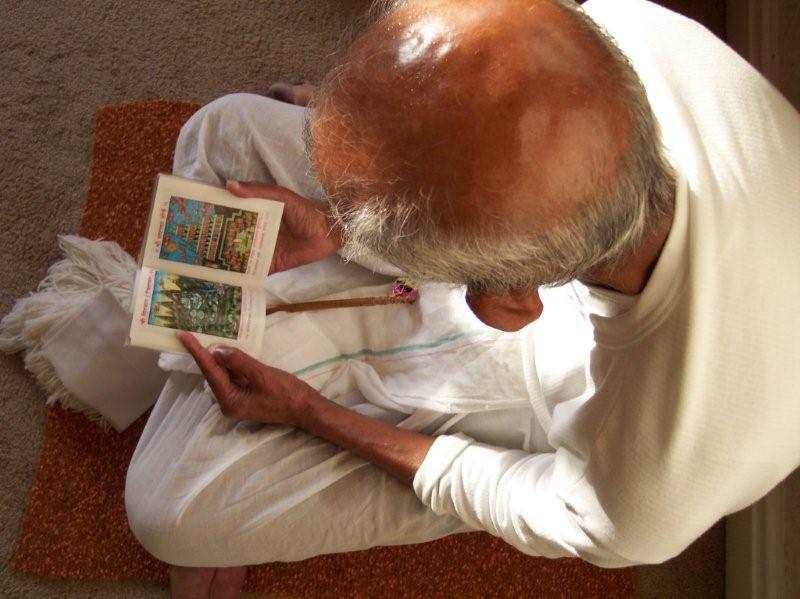 He is 86, and his faith intensity seems to increase every year. Today was a little difficult in the morning - I felt weak at first, but the strength slowly came after I had a shower. Hunger has disappeared and even thirst has reduced a lot. The Jains have a whole set of rules about the drinking of water - fortunately, my mother knows them all, and she prepares it with love for me. The water has to be pre-boiled, can only be drunk in daylight hours, and prayers have to be recited before and after drinking. Also the water has to be freshly boiled twice in the day - and there is a deep science behind this. The puja ceremony this morning was awesome - in our temples, everyone has a right to perform their own puja, and instead of chaous resulting, what I saw was total respect and harmony - people stood in line, did their worship in their own way, and then sat to sing some hymns. At a time you can hear many different hymns from different voices - but all that is allowed, as there is no middleman in the Jain religion when it comes to worship. Then in the lecture hall, one of our most sacred scriptures, the Kalpasutra, was brought with great pomp and ceremony - in a singing dancing procession. This is a very colourful ceremony and great fun to witness. Festivals and their intensity are so special, and so emotive, that to miss them is to miss a whole sublime experience. The lecture that followed was really moving. It focused on the great vows of our monks and nuns, and their deep discipline and sacrifice. Jain saints do not carry any money, have to walk barefoot to go anywhere, and have to seek alms for their food. They also take vows of non-violence and chastity, and observe these strictly. They are unique role models in a world where we are still debating global warming and sustainable living - all we need to do is to look at their lives and learn from their spirit. This can become a guide to our ideals, and the best part is that it is not just theoretical - it is being lived here and now. In the lecture, Yogeshbhai said how the number of people taking 'diksha' (renunciation) into sainthood is increasing, and many of them are sons or daughters of multi-millionaires. And in the diksha ceremony, they have to give up all their possessions, and pluck their hair out by hand, and do this with a smile. Sometimes, whole families take diksha together. This is the spiritual depth of India, one which still maintains its authenticity, in spite of modernity and technology. By dismissing religion as dogma, the atheists are disrespecting some of the most profound civilisations on the planet. I invite you to look into the depth of all faiths, and draw from their wisdom. Please do not dismiss them as dogma in one large sweep - that is the fallacy of science, whose aim often is to conquer nature rather than respect it. Workplaces can benefit from the festive experience. They too can learn from the ideals of different cultures and beliefs, and get inspired to seek new wisdom. I shudder to think that in the educated and civilised Britain of today, I still have to spell the word Jain. It really shows how culturally illiterate we are as a country, and how much we are losing through our cultural illiteracy. I hope to start to change this through my upcoming Masala Tour of Britain. Even in the best museums, culture is portrayed as an artefact to be admired, rather than objects which have deep stories and context, and have come out of profound spiritual experiences of artists.